“A great session! I always enjoy a relaxing massage about every three weeks to manage my stress and lifestyle. Working with Maggie was easy, from booking my appointments to the initial assessment to determine how to make my massage therapy most meaningful each visit. 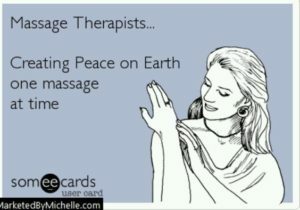 I finally have a trusted massage therapist – I recommend her highly!” Jim M.
“Maggie is a fantastic massage therapist. She brings my stressed and tight muscles such great relief; they always feel so much better after a massage. I am so grateful for her talents. Not only is she an amazing massage therapist, she in incredibly smart when it comes to anatomy. I trust her completely. She listens to my needs and concerns. I am looking forward to my next session!” Jen S.
“After a long weekend of watching volleyball games from unforgiving bleachers, Maggie released the tension in my shoulders, lower back and hips -I slept well that night!” Alicia K.
I have had back issues for the past 15 years, yet I feel great after a session with Maggie. I will continue to seek massage treatment from her. Joe M.
“’Maggie was very in tune with what my body needed. The massage was relaxing, but it was also a huge help to easing the extreme tension in my neck and upper back. I highly recommend her to anyone!” Elizabeth G.
I wanted to thank you for the excellent massages you have given me. Recently I arrived at your office stiff, tight and full of stress and you immediately put me at ease even before beginning the massage. Your professional approach extends well beyond the physical help you provide and I was relaxed and comfortable within minutes. By the time I left I felt like a new person. Thank you for your help. John N.